An overflowing creek is leaving Amherst homeowners with few options. The residents live near a Beaver Creek tributary and they've known for decades that the water running nearby can sometimes overflow. "It goes all the way through here," said Sylvia Syrowski, who lives at the end of the block, where much of the water gathers during heavy rains. 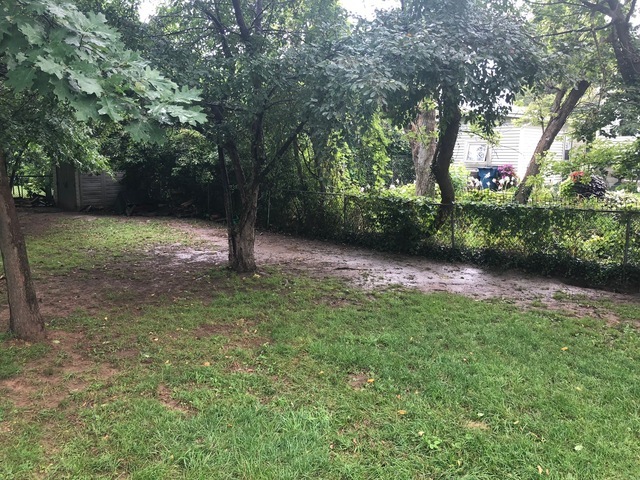 Syrowski says the water ran just feet from her basement windows after an abnormally heavy rain in late August, the creek pushed water into yards up and down the block. Mud and some exposed roots are all that's left after a flooded creek rushed through a handful of properties in Amherst. "They had their basement flood next door," said Syrowski, pointing to the neighbors' house. "We haven't had that happen yet, but I'm waiting." Across the creek from the Syrowski's home, Eric Long built a new barn after his old one started leaning towards the water. "The water was out past these rocks," said Long, pointing to rocks on the neighbor's property. "They were buried." Below: Video taken by neighbors while the tributary flooded earlier this week. Long, Syrowski and their neighbors, like Bill Nahm, tell News 5 they expected a $270,000 water runoff project to help the flooding near their properties. "I did," said Nahm. "I thought it was going to be the cure-all." The project was paid for by the Ohio Turnpike as part of a program to help alleviate the negative effects of noise and water runoff from the Turnpike. 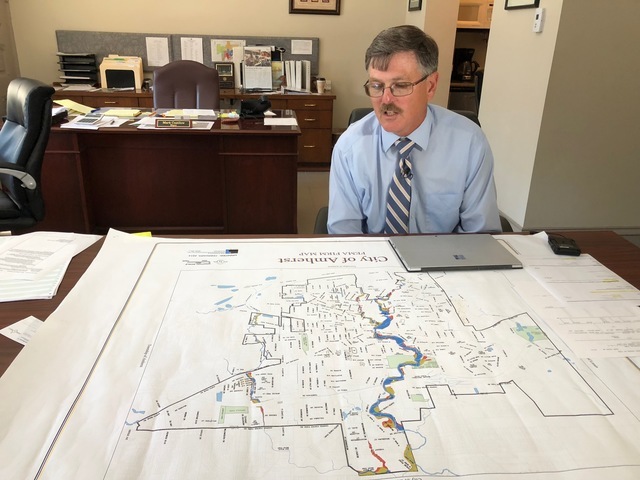 Bramhall Engineering's Aaron Appell consulted on the project and says roughly half of the total cost was used to install a retaining pond just a few hundred yards away from where Long, Syrowski and Nahm live. Amherst Mayor Mark Costilow looks over a F.E.M.A. Flood Map showing which parts of the city could face flooding problems. But Amherst Mayor Mark Costilow says the pond was never intended to improve flooding where Long, Syrowski and Nahm live. "That storm basin, to my knowledge, isn't slowing down what's already in that Beaver Creek Tributary," said Costilow. "That's to capture water before it enters the creek." 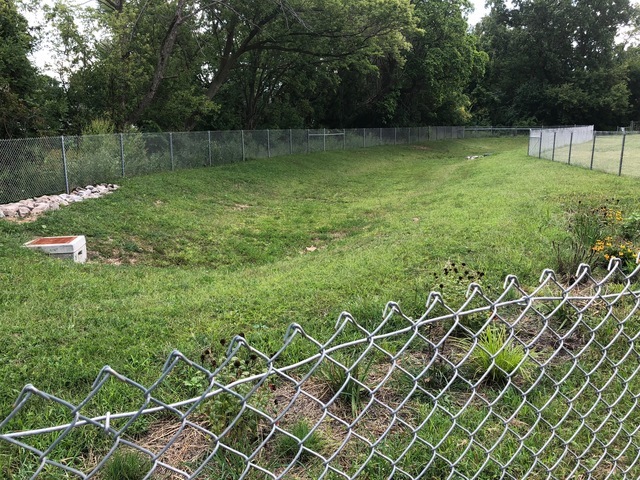 Appell says there's the potential for the pond to take pressure off the creek, but it's intended to catch runoff from the open field where a now-demolished school building once stood. Costilow says the flooding issues are what happens when homes are so close to running water, and F.E.M.A. flood maps show floodplains nearby. Still, neighbors say they've either lost barns or will have to move sheds farther away from the creek because of flooding and erosion concerns. "There are zoning laws that are in place now that probably weren't in place when those structures were built," said Appell. The retention pond at what used to be Shupe School in Amherst. Most residents are responsible for cleaning out the creek as it passes through their property. Many homeowners tell News 5 they want to make it wider or build up their land with dirt, but they say they've been told they're not allowed to or that it'll cost them too much.